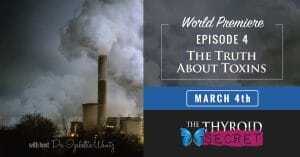 “The Truth About Toxins” is the fourth episode in The Thyroid Secret documentary. This episode discusses the big impact that toxins in our environment have on our thyroids and thyroid disease. It is estimated that we come in contact with over 80,000 different toxic chemicals every day in such things as food, makeup products, and our cars. That was quite a shocking statistic to hear. Our thyroid, which is programmed to take in nutrients, instead starts taking in toxins we’re exposed to, making us sick. Possibly even triggering autoimmune disease. When toxins enter our body, our cells go into danger mode, slowing or even shutting down to protect the body. Nowhere has this been more evident than in the Ukraine in the aftermath of the Chernobyl nuclear accident. Studies have shown that nearly 80% of the children in the area have developed thyroid problems. And there is an epidemic of thyroid cancer around Fukushima, as well. Dr. Wentz mentions several of the different common, every day toxins we come in contact with, some you wouldn’t even suspect. They include plastic bottles, dental amalgams, fire retardants, parabens, thalates, pesticides, off-gasing of bromine from new cars. Even some of our food contains toxins. Dr. Wentz states that high fructose corn syrup can contain mercury and rice is high in cadmium and arsenic. This episode, “The Truth About Toxins”, was eye opening. I never realized just how many toxins we are subjected to on a daily basis. If you’re concerned about how toxins in your environment are affecting your Hashimoto’s, you definitely must watch this episode. You can own this episode, along with the rest of The Thyroid Secret documentary. Click here to order The Thyroid Secret. If you have found this post helpful, please share it and spread the word!